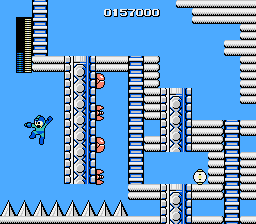 NES Mega Man (JPN/USA) in 15:29.27 by Deign. On this site, we make perfect movies, and then we surpass them. Of course, if we can surpass them, they were not perfect in the first place, but who would have known? When "perfection" is defined as "as fast as possible", it requires some sacrifices. Indeed, this movie sacrifices a lot in the playability of the game. Full of tricks to pass through walls, tricks to avoid mandatory battles, tricks to pass through enemies relatively unharmed, tricks to acquire weapon refills in little time — there is very little in this movie left that resembles normal playing. Even death is used as a viable playing strategy that saves time. All of the tricks are still performed by the means of mere controller input, even though portions of the input were calculated by a computer program (approximately 26 seconds in total). This movie is a significant improvement of 9 seconds to the previous movie; consisting of many micro-optimizations and a few major ones, including a new trick or two in the Cutman stage. Note: This movie works on both the US and Japanese versions.